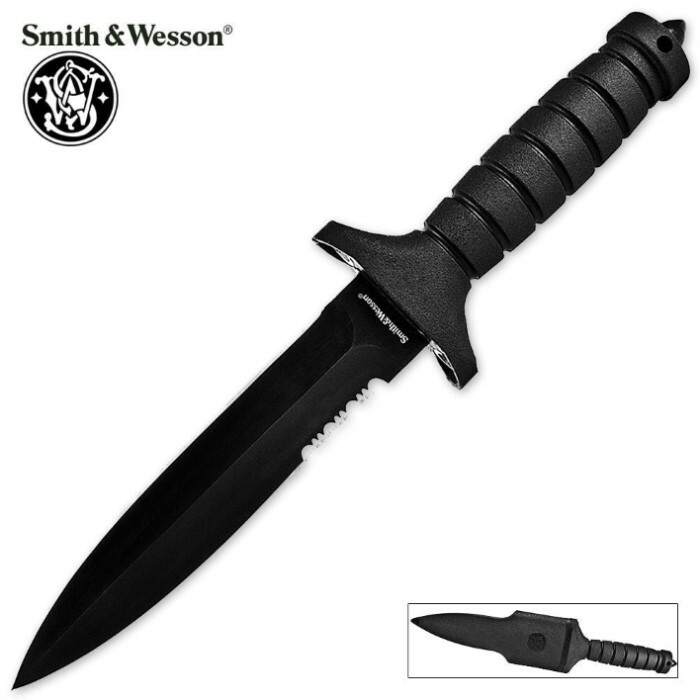 Smith & Wesson HRT10B Hostage Rescue Team Knife | BUDK.com - Knives & Swords At The Lowest Prices! This Smith & Wesson Hostage Rescue Team knife is built for just what the name implies-rescue situations, or any other major task at hand. The partially serrated stainless steel blade with a cast ABS handle is built for hard use, offering an extremely good grip. Includes a fiberglass lined nylon sheath. Very good blade but the button that warps around the grip to secure it to the sheath came off as soon as went to put it back in the sheath. The other thing is that when the knife is in the sheath it moves around and wiggles. Overall, the knife is very good and well made but it is the sheath the lows the value. The blade is amazing, cuts very well and the crushing tip hurts with only a small application of pressure. The only "problem" is the sheath has a release mechanism for the knife so it is sometimes a nusiance to take out. Still a great buy though.